Chemical structure Epigallocatechin gallate(EGCG), also known as epigallocatechin 3-gallate, is the ester of epigallocatechin and gallic acid, and is a type of catechin. 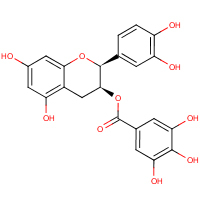 EGCG is the most abundant catechin in tea and is a potent antioxidant that may have therapeutic applications in the treatment of many disorders (e.g. cancer). It is found in green - but not black - tea, as EGCG is converted into thearubigins in black teas. In a high temperature environment, an epimerization change is more likely to occur; however as exposure to boiling water for 30 straight minutes only leads to a 12.4% reduction in the total amount of EGCG, the amount lost in a brief exposure is insignificant. In fact, even when special conditions were used to create temperatures well over that of boiling water, the amount lost scaled up only slightly.EGCG can be found in many supplements. There has been research investigating the benefit of EGCG from green tea in the treatment of HIV infection, where EGCG has been shown to reduce plaques related to AIDS-related dementia in the laboratory, as well as block gp120. However, these effects have yet to be confirmed in live human trials, and it does not imply that green tea will cure or block HIV infection, but it may help regulate viral load as long as it is not involved in adverse drug reactions. The concentrations of EGCG used in the studies could not be reached by drinking green tea. More study into EGCG and HIV is currently underway. There is increasing evidence to show that EGCG along with other flavonoids can be beneficial in treating brain, prostate, cancers. EGCG has been shown to bind and inhibit the anti-apoptotic protein Bcl-xl, which has been implicated in both cancer cell and normal cell survival. Xu et al. found that antiangiogenic effects of EGCG inhibits the growth of blood vessels and thus reduces lesion size in experimental endometriosis (mouse model).>Drug Interactions. A recent study using mouse models at the University of Southern California showed that, in contrast to the myriad benefits commonly associated with green tea and green tea extract (GTE), EGCG binds with the anti-cancer drug Velcade, significantly reducing its bioavailability and thereby rendering it therapeutically useless. Dr. SchÃ¶nthal, who headed the study, suggests that consumption of green tea and GTE products be strongly contraindicated for patients undergoing treatment for multiple myeloma and mantle cell lymphoma. EGCG has a slight stimulatory effect due to it increasing adrenaline levels. Epigallocatechin-3-gallate, may reduce the bioavaialbilty of the drug sunitinib when they are taken together. EGCG was, among other tea polyphenols, found to be a strong topoisomerase inhibitor, similar to some chemotherapeutic anticancer drugs, for example, etoposide and doxorubicin. 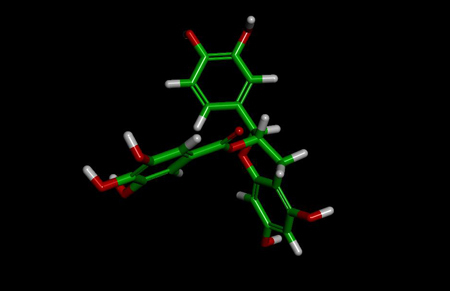 This property may be responsible for anticarcinogenic however also a carcinogenic potential of the substance. High intake of polyphenolic compounds during pregnancy is suspected to increase risk of neonatal leukemia. Bioflavonoid supplements should not be used by pregnant women.A strong association between high intake of tea during pregnancy and elevated risk of childhood malignant central nervous system (CNS) tumours was found.